Tbilisi Mayor Kakha Kaladze rejects the spread information that a residential complex will be built on the territory of 109 public kindergarten, located in the capital’s Isani district. The Mayor explains the kindergarten building is damaged and needs to be demolished. “We have the results of Samkharauli Expertise Bureau examination, which reads this building is dangerous for children. This is why we decided to distribute the children to nearby kindergartens,” Kaladze said. The mayor said there are a total of 11 problematic kindergartens in Tbilisi, adding 5 of the buildings cannot be rehabilitated and need to be demolished. 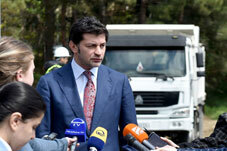 “We are doing our best to solve the problems at these kindergartens by the end of this year,” Kaladze said. The parents, of those children who go to the Kindergarten 109, protest the Mayor’s Office decision. They claim that the territory has been sold and a block of flats will be built there. Moreover, they refuse to transfer their children to nearby kindergartens. The parents blocked the road to the kindergarten on Tuesday, asking for proper explanations. Part of the parents claim that Samkharauli Expertise Bureau issued the result of the examination a month ago, however, they were notified that the kindergarten stopped functioning only on April 18. Deputy Mayor Ilia Eloshvili met with the protesters and offered them to set up a 10-member group, which would supervise the process of the new kindergarten construction on the same territory. “The tender on construction of a new kindergarten has to be announced soon. The tender will take 3-4 months and the construction works – around one year,” Eloshvili told the parents. The parents demand another study of the building is carried out, saying they do not believe the construction is useless.